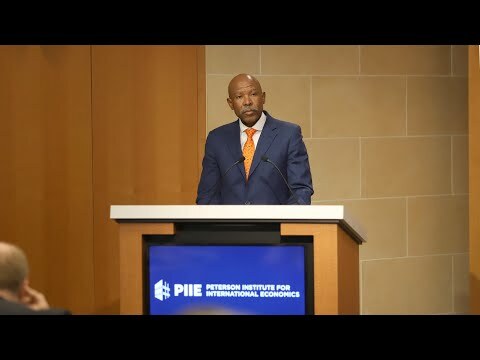 The 19th annual Stavros Niarchos Foundation Lecture at the Peterson Institute for International Economics took place on April 15, 2019, featuring governor of the South African Reserve Bank and chair of the International Monetary and Financial Committee Lesetja Kganyago. The Stavros Niarchos Foundation Lecture at the Peterson Institute invites leading global figures in economics and economic policy to discuss contemporary issues in the field. Past speakers include Alan Greenspan, Tharman Shanmugaratnam, and Long Yongtu. Stavros Niarchos Foundation (SNF) Chief Administrative Officer Vasili Tsamis delivered brief remarks at the event. "Events like this one here tonight create an open forum for experts like Governor Kganyago to offer individual insight and share personal expertise, and for us—including those joining us online—to engage in this discussion. We at the Stavros Niarchos Foundation will leave specific discussions of yield curve inversion, trade war impact, and the Consumer Confidence Index to you, the economists. But on the topic of "discussion" itself, we do have something to say.... An increasing focus in [our] grantmaking has been on sustaining spaces where open discussion, civil discourse, and civic engagement can take place, and on supporting institutions that produce and disseminate rigorous expert analysis." SNF has provided support to the Peterson Institute, a non-profit think tank based in Washington, D.C., repeatedly since 1998.